Please refer to our stock # 619 when inquiring. Generally excellent early little block letter marking Bebe by Gaultier ... France circa 1878 .... in lovely small size about 15 " ( 38 cm ) with fine quality of pale pressed bisque and softly blushed complexion, amber brown inset enamal eyes and original fur wig on cork pate . Has fine pale pressed bisque socket head of best quality of bisque and painting for an early doll with brown enamel glass paperweight inset eyes with dark eyeliner , has mauve blushed eye shadow , long painted curly lashes and widely feathered brows . Closed mouth with upturned kiss lips which are fine accented and outlined , has implied modeled tongue and an funny dimple chin , pierced ears with earrings and her wonderful blonde curled original lamb fur wig on original cork pate !! She has her original French composition and wooden eight - loose - ball body with original body finish and straight wrists . 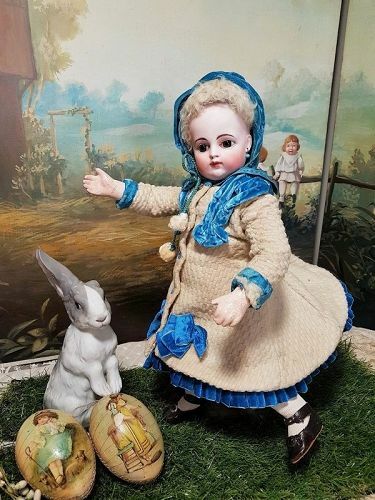 Wearing very beautiful and all original cream wool coat dress with pretty blue silk velvet decoration and matching bonnet , pair of bloomers and original chemise , French stocking and shoes . A stunning cabinet size early Bebe ..... a treasure and must have for each collection . If you have any question or if you need more or special pictures let me know and thank you for your interest on my Doll-Shop ! !